The smartphone or your iPhone for that matter is a wonderful gadget. It serves as your communication tool, entertainment source, your booking engine, and even your reference guide. But too much time with your iPhone could be a distraction as well. It might affect your personal and work life negatively. Forest – Stay Focused app for iPhone gives you a reason to stay away from your phone and instead focus on other important things in life. Forest – Stay Focused for iPhone function based on the Pomodoro technique. If you want to temporarily put down your phone and focus on what’s more important in real life, you can plant a seed in Forest. As time goes by, this seed will gradually grow into a tree. However, if you cannot resist the temptation of using your phone and leave the app, your tree will wither. The sense of achievement and responsibility will encourage you to stay away from your phone, and will help you make better use of your time. You know what works best for you. Setting a timer for a block of time to focus within can increase your productivity. The more time you focus, the more the tree grows. By the time you’d finished, you will have something truly beautiful and unique. If you exit the app for any other application, the tree will die in couple of seconds. As the tree grows, you will be awarded coins. 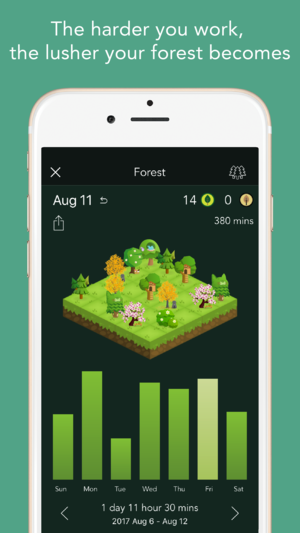 The goal is to grow a tree with each timer you set by not exiting the app and, thus, not getting distracted by your iPhone. Over time, the virtual trees that you’d grown will make up a virtual forest that you can view in the app. You can even compete with friends in growing the virtual forest. The UI layout is simple. You can also track the total time you’d spent on your phone. You can get t Forest he app for $1.99. Forest – Stay Focused for iPhone allows users to use timer-based techniques to focus, and actually provides a solid incentive for staying off of your iPhone. With each timer that you’d set, a tree will grow. The more you focus and stay with the app, you will eventually own a lush forest as a testimony to the time you’d spent doing productive things and stayed away from your iPhone. The option to view detailed statistics of your time distribution comes handy. You can also track your daily phone usage and screen time. Check it out if you want a motivation to stay away from your iPhone during productive hours.